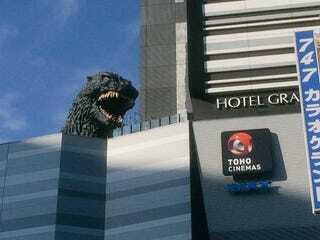 Previously, Kotaku reported that a Godzilla hotel was opening in Tokyo this April. Next to the hotel, a huge 'Zilla head was slated to appear, but all we've seen were computerized concept images. Until now. I think we can all agree: This room has the best view in Tokyo. Today, the actual Godzilla head was unveiled for the first time. It towers over Shinjuku, making a very cool addition to the Tokyo cityscape. Have a look for yourself.